Hello ... Hello ... my old friends ... It's great to see you once again! 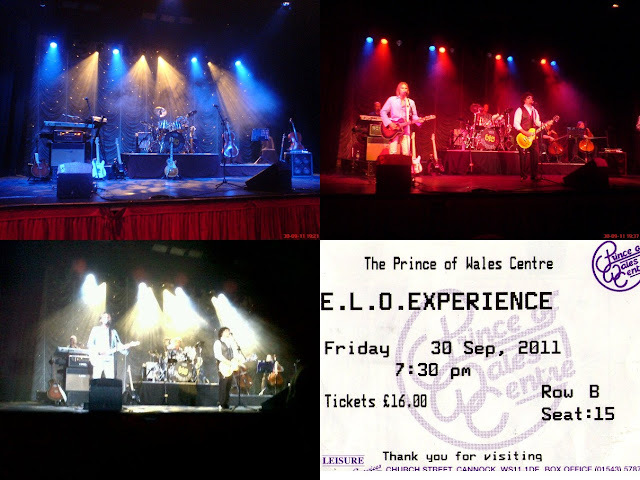 It was an easy decision to drive the ten  miles or so to Cannock in Staffordshire on Friday 30th September [and take my daughter Rebekah] to another amazing concert by Andy Louis and The ELO Experience at the Prince of Wales Theatre. As ever, we witnessed another accurate, exuberant and professional show performed by a band who are now - in the absence of UK touring these last two  years by The Orchestra [former members of ELO and ELO Part II] - filling the gap [so to speak] and satisfying the appetite of those fans who earnestly desire to hear the music of ELO performed live whilst doing justice to the bands sonic heritage. The band perform an outstanding version of "Standin' In The Rain" that leaves the knowledgeable in the audience expecting the transition into "Big Wheels" like a hand in a glove before abruptly halting! In an expansive set list that ranged from 1972's "Roll Over Beethoven" to 1986's "Calling America", the highlights [for me] were a stomping "Diary Of Horace Wimp", a rip-roaring "Showdown" and their crowd pleasing encore of "Mr. Blue Sky". But, once again, their rendition of "Don't Walk Away" - fittingly dedicated to the late, great Kelly Groucutt - was simply breathtaking and stole the show! The band have matured both in terms of production, sound and cohesion with the addition of their two  cellists and lack only an excitable violinist to complete the picture! Yours truly KJS had the chance to chat with one or three band members after the gig and the conversation naturally came around to what songs they were going to attempt next. I'm excited at the prospect of The ELO Experience covering such ELO classics as "Can't Get It Out Of My Head" and "Strange Magic" in their 2012 set but the real surprise is that they are actively considering doing a live version of "Latitude 88 North"! We can only look forward to their 2012 gigs! ELO Beatles Forever [ELOBF] recommends The ELO Experience to those enlightened folks who enjoy the music of ELO, Jeff Lynne, Roy Wood, The Move, The Idle Race, 'Brum Beat', The Beatles and related artistes.